Family:Dasyatidae Family: Dasyatidae Whiptail Stingrays; whip-like tails, which are much longer than the disc and lack dorsaland caudal fins. They also have one or more venomous spines near the base of the tail. GENERAL/CHARACTERISTICS: Angular disc. Dorsal color reddish-brown to olive drab with blue spots and smaller black spots, ventral side white. Tail with black and white bands is about as long as the body and usually has one stinging spine. Maximum disc width: 50 cm (20 inches). DISTRIBUTION/ HABITAT: Tropical Indo-West Pacific from the Red Sea east to the Philippines, Japan, and south to Australia. Found on sandy bottoms near coral and rocky reefs, from intertidal zone to 50 m (160 feet). Moves onto reef flats and into shallow lagoon waters at high tide. DIET IN THE WILD: Crabs and shrimp, also small fishes. REPRODUCTION: Ovoviviparous; eggs retained in the female’s body; embryos receive nourishment from a yolk sac. 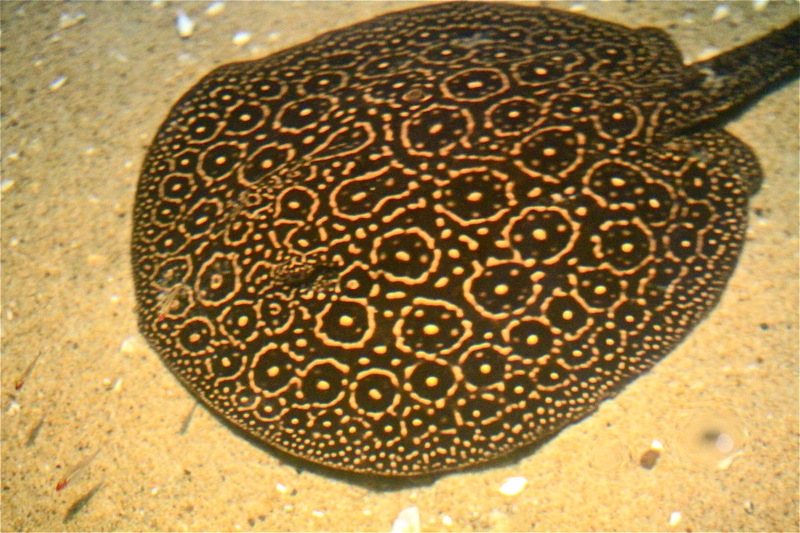 REMARKS: The Bluespotted Whiptail Stingray is venomous tail can deliver a painful wound. Like many other rays that wound humans, it usually stings only when inadvertently stepped on: it is difficult to see in turbid waters, especially when covered by sand with only the eyes visible. DISTRIBUTION: Collected in the Rio Tapajos River, Brazil. HABITAT: The shallows of major rivers and slow-moving tributaries with substrates of mud or sand. Lost ability to retain urea decreasing osmolarity for fresh water unlike salt water relatives. APPEARANCE: The patterning of this “species” is highly variable, with no two examples appearing the same. Some have golden markings, while others are almost white. Similarly, the amount of darker pigmentation can also vary in both shade and coverage. REMARKS: Consumed by native tribes of the Amazon. Potamotrygon sp. Have a venomous barb which can cause a serious and painful wound usually in the lower leg. (Walking with a shuffling gate in water will encourage the ray to move out of the way.) In severe wounds symptoms may include nausea, vomiting, fainting, salivation, muscle cramps, diarrhea, seizures, shock and rarely death. Initial treatment uses hot water to help inactivate the venom and transfer to a medical facility to clean the wound and treat symptoms.